Add mystery and glamor to your next belly dance or Bollywood costume with this beautiful and versatile chiffon sparkle dot head veil. Add mystery and glamor to your next belly dance or Bollywood costume with this beautiful and versatile chiffon sparkle dot head veil. Use as a head scarf, face veil, or any other costume accessory! 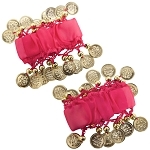 Comes with a colorful beaded head piece with coins that can be pinned to the veil in front or back to complete the look. Great for kids and adults alike! Measures approx. 19.5 inches by 38.5 inches.